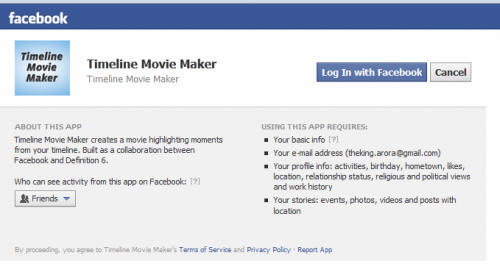 Now make your Facebook timeline video using the timeline movie maker,an official app by Facebook which will extract photo and news feed and create your amazing timeline video.now its very with the new official called timeline Movie maker. For making Timeline video you need to activate Facebook Timeline which is already rolling out to every Facebook user and choose correct Facebook cover photo size.Once you have started using timeline then you will be able to understand new feature and layout of Facebook timeline. Facebook Cover photo Size:The New Facebook Cover Size Photo is “850px×315px”(850 wide and 315 height).The Minimum width of cover photo is 399px.if you size below this minimum then Facebook will allow you upload it to your account. The concept of making Facebook timeline video is very much interesting.As the App is official so you can use it with confidence without any afraid of virus and malware which we normally get in some application.So How to use this app?open the app and click on “Make My Movie” button.After it,a pop-up appear which ask for app access permissions,and then access to news feeds and when you are done it will create an amazing Timeline video for you .You can share you timeline video only with your friend.If have set privacy setting public ,even then everyone will not able to see your movie. 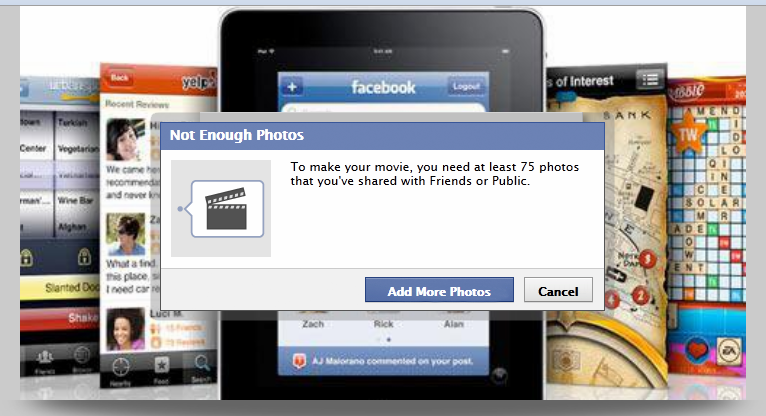 Note:For making Timeline video you must have at least 75 Photo in your Facebook account. Paul Hernacki, CTO, Definiton 6 made the announcement via Twitter, tweeting, “Pure awesomeness- Facebook and @Definition6 are proud to launch http://timelinemoviemaker.com Make an instant movie of your Facebook content. Click on Make My Movie and login With Your Facebook Account. Click on Allow to use Timeline Movie Maker. But the problem if you have less than 75 photos then it will show you below picture and does not create video for you.So be ensure that you have almost 75 pic in your Facebook account before creating video.